Our Printed Paper Shopping bags feature your design and message on one or two sides of the bag. Each Custom Paper Shopping Bag is made of natural, 100% recyclable, brown Kraft paper, and features twisted paper handles and a flat bottom. 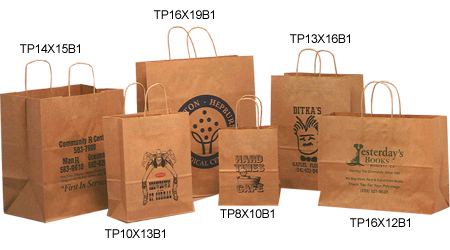 Great for restaurant retailers, and more, the Custom Paper Bags are available with a one- to four-color imprint. TP8X10B1 8¼" x 4¼" x 10¾" Brown Paper Shopping Bag 0.59 0.56 0.54 0.51 0.49 5" 5"
TP10X13B1 10" x 5" x 13" Brown Paper Shopping Bag 0.56 0.53 0.50 0.47 0.45 7" 7"
TP16X12B1 16" x 6" x 12½" Brown Paper Shopping Bag 0.62 0.58 0.55 0.54 0.52 10" 6"
TP13X16B1 13" x 6" x 15½" Brown Paper Shopping Bag 0.63 0.59 0.56 0.54 0.53 9" 7"
TP14X15B1 14" x 9" x 15½" Brown Paper Shopping Bag 0.72 0.68 0.65 0.63 0.62 10" 7"
TP16X19B1 16" x 6" x 19" Brown Paper Shopping Bag 0.70 0.65 0.63 0.61 0.59 10" 8"
It's easy to get started with your Printed Paper Bags. Simply contact us at 1-800-233-0828 and submit your camera-ready artwork to graphics@kardwell.com (you can also mail your art). You will receive your Printed Brown Shopping Bags in about 5 weeks. Rush delivery is available.